How to mix your own muesli at home, without any oil or added sugar, just oats, dried fruit and lots of seeds. A super healthy, vegan, gluten-free recipe. My husband loves this Homemade Muesli Mix. It has been a staple in our house for almost 10 years now, in all these years we’ve never been out of it. I bought a large bowl especially for it, so I don’t have to make it every week, this way I only have to mix it again like every 3 weeks or so. I think my husband eats it every day, if he doesn’t manage to eat it at breakfast, than he just takes a jar full of it at work or eats it at 10 o’clock in the evening while watching TV. For me this is the healthiest breakfast I can think of. It contains only healthy ingredients, it makes you full and gives you energy and it is so versatile that you don’t get bored with eating it almost every day. 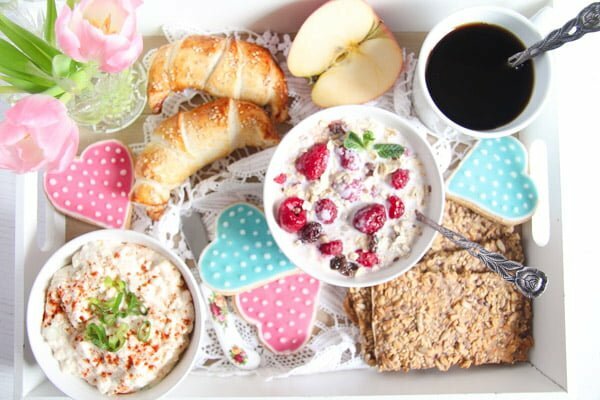 The perfect way of starting the day, since skipping breakfast is always bad news for your metabolism. 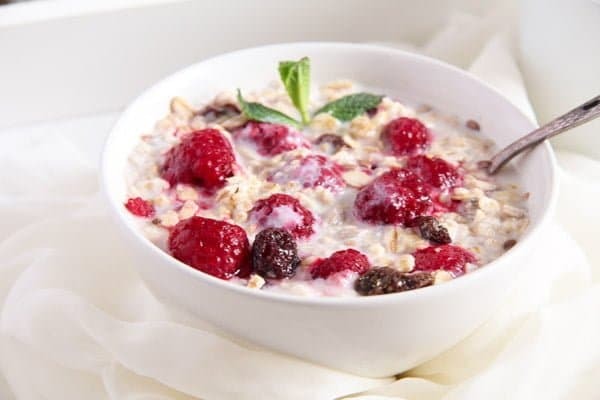 Muesli is rich in fiber and protein, a macronutrient vital to losing weight and repairing all tissues like muscle, bone and skin. It is also used in making essential hormones and enzymes that support our immune system. It takes longer to digest protein than it does carbohydrates. So, a protein-rich meal will keep hunger at bay for hours compared to a meal made up of mostly carbs. And unlike most cereals, muesli is low in sugar. If you worry about the dried fruit containing more sugar than you would like to eat, reduce the quantity or leave them out completely. They can be replaced with different kind of nuts and you can chop some fresh fruit into your bowl every morning. 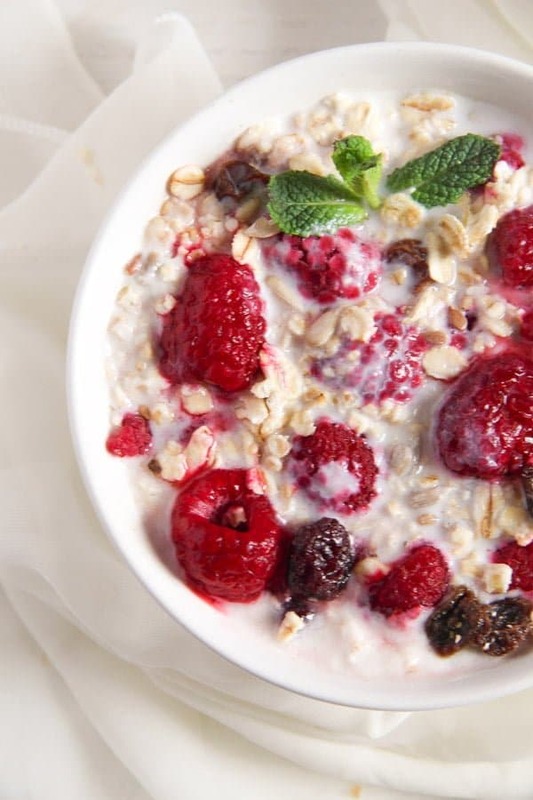 Protein-rich foods like muesli provide the body with energy to keep going and has been shown to promote long term weight loss, along with countless other health benefits. In order to maintain a proper level of protein for your lifestyle, it’s important to consult a doctor or nutritionist and adjust accordingly. These facts have been put to my disposal by Aaptiv an audio fitness company that educates people on how fitness and nutrition go hand in hand. 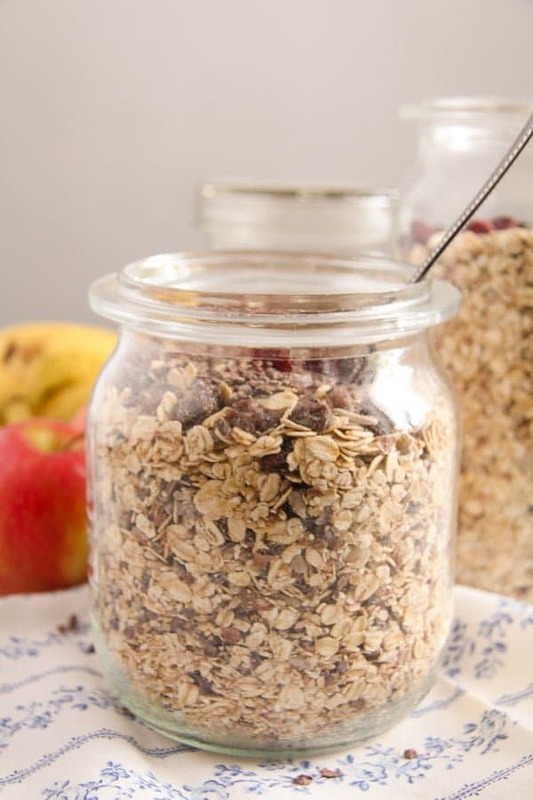 This recipe for Homemade Muesli Mix – No Added Sugar or Oil, Vegan, Gluten-Free is incredibly versatile, the indicated ingredients here should only give you an idea of what you can make, you can change most of the ingredients according to your taste. Of course, the oats are mandatory, but otherwise the sky is the limit. The best thing about this muesli mixture is that there is no added sugar in it. The sweetness comes entirely from the dried fruits. This was actually the reason I started making it. I just wanted to eat muesli with no sugar in it and I couldn’t easily find any. Every brand I checked was full of it and the one or two sorts without sugar were costing about 3 times as much as the sugared ones. But, if you think that dried fruits still contain more sugar than you would like to eat in the morning, you can also leave them out. When it comes to the dried fruit, I always take dates because my husband likes them so much and raisins because they’re inexpensive and I’ve always loved them. Sometimes, for a change, I add some dried apricots, figs or some cocoa nibs. And I especially like dried cranberries in it. You can also vary the seeds you use or you can use all sorts of nuts instead or a mixture of seeds and nuts. I normally use flaxseed, sunflower and sesame seeds, but I also made it with chopped almonds, walnuts, hazelnuts or pumpkin seeds. Adding some chia seeds is also a good idea. 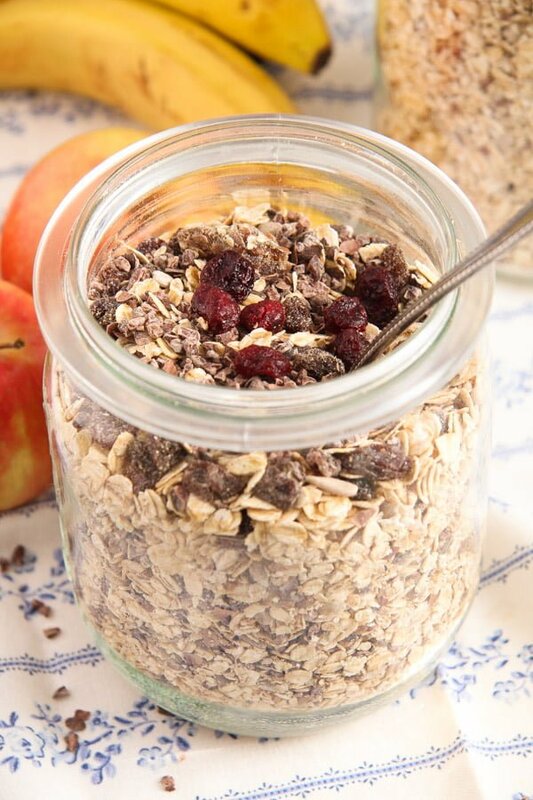 The way to eat the Homemade Muesli Mix – No Added Sugar or Oil, Vegan, Gluten-Free is also versatile. 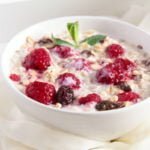 I usually have it with low-fat milk, but you can also make porridge out of it or eat it with yogurt and chopped fresh fruits. 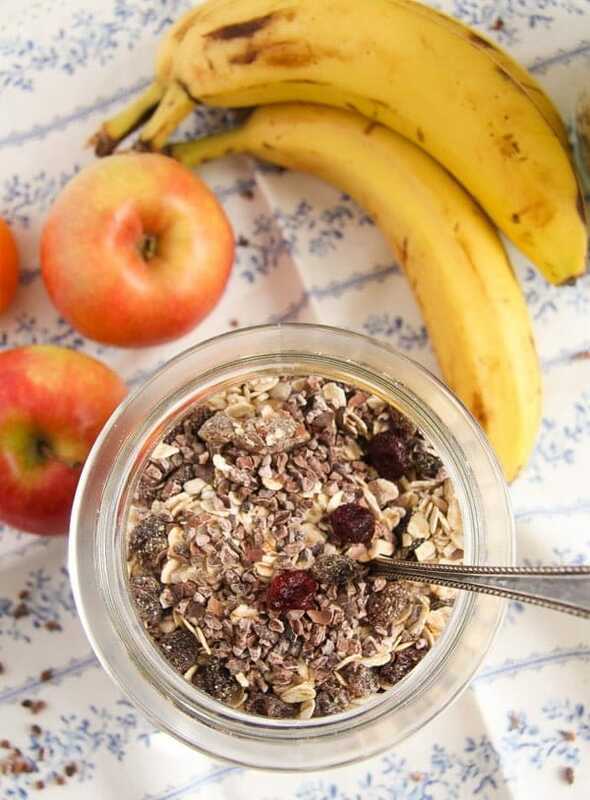 You can add any fresh fruit you like to your muesli, my personal favorites are bananas and apples, the two kinds of fruit I ALWAYS have in the house. But berries (fresh or frozen) are amazing as well. I normally don’t sweeten the muesli in my bowl or the porridge, the bananas and dried fruit give the muesli enough sweetness. But if you like, you could add a drizzle of honey or maple syrup. The quantities in the ingredients list are just to give you an idea, I actually never measure anything. I take whole bags of oats, raisins and dates and pour seeds and nuts over them straight from the bag. I mix everything using my hands. Mix everything together in a big bowl. Cover and keep in the pantry. 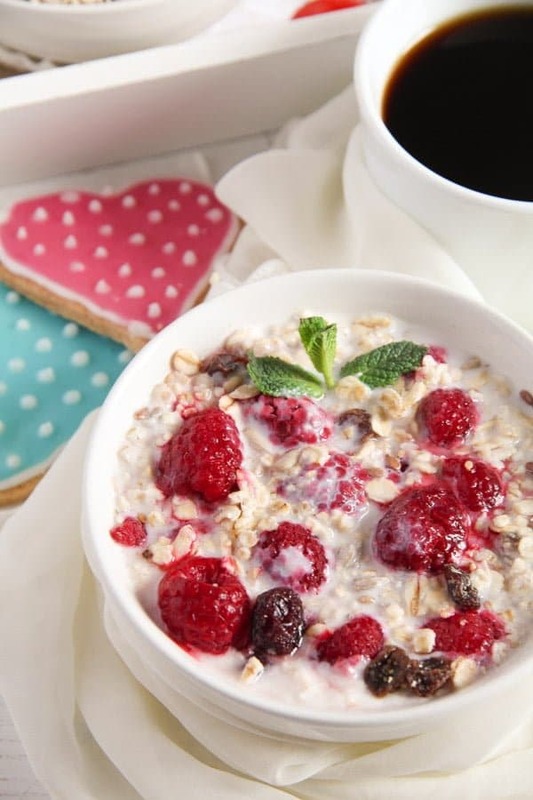 Enjoy with milk or nut milk, yogurt, fresh fruits or as porridge. You can add a drizzle of honey or maple syrup into your breakfast bowl, if desired. My whole family loves this homeland-muesli-mix—- thank you very mutch, Adina! ! Welcome, glad you liked it. Mache es jetzt genauso wie du: große Schüssel von dem leckeren Müsli zubereiten, und meine Familie bedient sich! Das Müsli selber zuzubereiten, ist wesentlich preiswerter,als die fertigen Packungen, und es schmeckt meinen Lieben dazu noch besser! Vielen Dank, Adina!! Looks delicious. My husband used to make his own muesli as he preferred it to the one that is shop-bought. 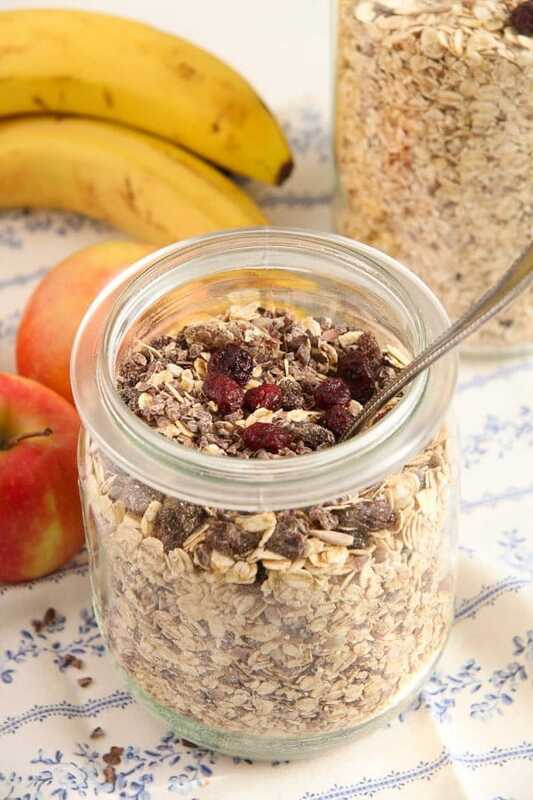 The homemade muesli is so much better , healthier and cheaper than the bought one, isn’t it? I haven’t bought any in 10 years. I love this food suggestion. Healthy, easy to prepare, can do ingredient variation and an easy grab and go meal. And yes, I like to add honey with meals and drinks, it makes it more healthy. Thanks for sharing your recipe, Adina! Your husband isn’t the only one that loves this mix. So do I! Can’t wait to give it a try. It is so good and easy, you will end up making it all the time, MJ.